Sydney is known for nightlife, trails, beaches, parks, and museums. 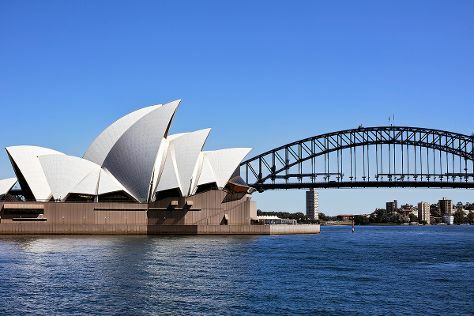 Your plan includes some of its best attractions: see a show at Sydney Opera House, tour the pleasant surroundings at Bondi Beach, wander the streets of Darling Harbour, and examine the collection at Australian National Maritime Museum. To find where to stay, photos, traveler tips, and tourist information, refer to the Sydney online day trip planner . Austin, USA to Sydney is an approximately 22-hour flight. You can also do a combination of bus and flight; or do a combination of flight and train. The time zone difference when traveling from Austin to Sydney is 16 hours. In August, Sydney is much colder than Austin - with highs of 66°F and lows of 49°F. Finish your sightseeing early on the 10th (Sat) so you can travel to Melbourne. Explore the numerous day-trip ideas around Cairns: Hartley's Crocodile Adventures (in Palm Cove) and Safaris (in Port Douglas). Spend the 11th (Sun) among aquatic life with a scuba or snorkeling tour. There's still lots to do: hike along Esplanade Boardwalk. For reviews, where to stay, ratings, and other tourist information, read our Cairns trip planner . You can fly from Sydney to Cairns in 6 hours. Other options are to drive; or take a train. In August, Cairns is somewhat warmer than Sydney - with highs of 80°F and lows of 63°F. Cap off your sightseeing on the 13th (Tue) early enough to travel to Melbourne. Melbourne is known for museums, shopping, parks, zoos & aquariums, and nightlife. Your plan includes some of its best attractions: take in nature's colorful creations at Royal Botanic Gardens, admire the masterpieces at National Gallery of Victoria, admire nature's wide array of creatures at Melbourne Zoo, and get lost in a book at State Library of Victoria. For more things to do, photos, traveler tips, and other tourist information, refer to the Melbourne trip itinerary site . Traveling by flight from Cairns to Melbourne takes 6 hours. Alternatively, you can drive; or take a train. Prepare for cooler weather when traveling from Cairns in August: high temperatures in Melbourne hover around 57°F and lows are around 42°F. Finish your sightseeing early on the 16th (Fri) so you can travel back home.